Joy Christian School (JCS) is pleased to announce Tyler Estes has accepted a position to work alongside Alicia Roberts as mentor and consultant for JCS students in the prototyping phase of the GCU STEM 1,2,3 Impact Grant and Shark Tank Competition. Mr. Estes currently works on global research and application of water quality technologies. His background includes employment with Tesla Solar Technologies and employment in other high-tech industries in the areas of sustainable energy, bio-mechanics and aerospace technologies. Mr. Estes subject matter expertise will help JCS students critically analyze possible solutions for real-world problems within the homeless mission field JCS students have set out to positively impact. This August, a select team of JCS’s high school students will participate in the design and prototyping phase of the STEM 1,2,3 Impact Grant and Shark Tank Competition. Student designs, and prototypes will focus on two critical needs for those homeless and living on the streets: access to clean water; and access to a reliable source of light. The JCS high school team will be challenged with designing an all-inclusive unit that is solar powered and serves as a water purification unit, mister and inflatable lantern. JCS is incredibally fortunate to have Mr. Estes work with us on this mission to support the needs our brothers in sisters in Christ. Please follow us on Facebook to find more information and updates on this exciting opportunity for our students. I will be there to greet you and assist you with any questions you may have regarding the new school year. The first day of school is Monday, August 6 from 7:45pm-3:10pm. I look forward to seeing you! Had a couple questions from the email this morning. See the updated sports listing below. We will be adding to the sports list based on interest. Some of the sports we are looking at adding: Brazilian Jiu Jitsu, Olympic Weight Lifting, Rugby, Soccer (Need a coach). Welcome to the official start of the 2018 – 2019 School Year! The 4th of July not only marks our day of Independence, it often signals the official start of a new school year. Your administrative team has been busy over the last month finalizing details for this upcoming school year. It's an exciting time filled with the hope of new opportunities and the anticipation of unexpected blessings that come with each new school year. We have already seen God move mightily on our campus giving us favor in our hiring, building of community partnerships and the chance to welcome many new families to our campus. We are so very grateful that each of you have chosen to spend the upcoming school year with us. It’s shaping up to be one of our best years yet! Let’s get ready to SOAR! off to the GCU Shark Tank we go! Our JCS STEM Impact Grant proposal has been selected as one of the GCU STEM Impact Grant applicants to move on to round two. Winning round two could net the school $11,000 to assist with technology costs associated with the project. Special thanks to our current community partners Maricopa Air Quality Control, Core Construction, and STEM 101 Corporate Connections. We appreciate your partnerships! JCS Student representatives will present their project in front of a “Shark Tank” group in November. What an awesome experience this will be for our students! Mark your calendars – the MS/HS Orientation will occur on July 26th from 9:00 – 11:00am in the JCS Library/Coffee Shop. During this time students will be able to pick up schedules, purchase and order uniforms, and a whole lot more. Further details will be forthcoming from Mr. Terrall. Uniforms getting a little tight? I bet they will be by the end of the summer! We will have a limited stock of K – HS uniforms available at the July 26th Orientation from 9:00 – 11:00am. Or if you wish, follow the link to our JCS Uniforms page on our website and get a head start on your uniform purchases. Uniforms are delivered directly to the school twice a month. Joyful Closet located in the JCS lobby. You might just find the size your looking for! All returning and new athletes, please watch your e-mails for coaches’ invites to summer camps and open gym times. Contact Mr. Blakesley if you have any questions regarding our Athletic Program or specific sports. The JCS International Student Department is looking for a few good families to host for next year. Please contact Grace Anderson at grace.anderson@joyschool.org for more details and possible tuition benefits. As we continually look for ways to serve our staff and families, we’ve decided to move a few of our administrative offices. When signing in, our front Receptionist, Chelsea, will be happy to direct you to our Principals, Human Resources Director, and Superintendent’s new locations. We are feeling so blessed that God has called such highly qualified, experienced, and caring teachers and staff to Joy. We are in the process of highlighting our teachers and staff on our school website. We have also adjusted some job responsibilities to ensure we continue to put our focus on the areas that matter most to our families and staff. 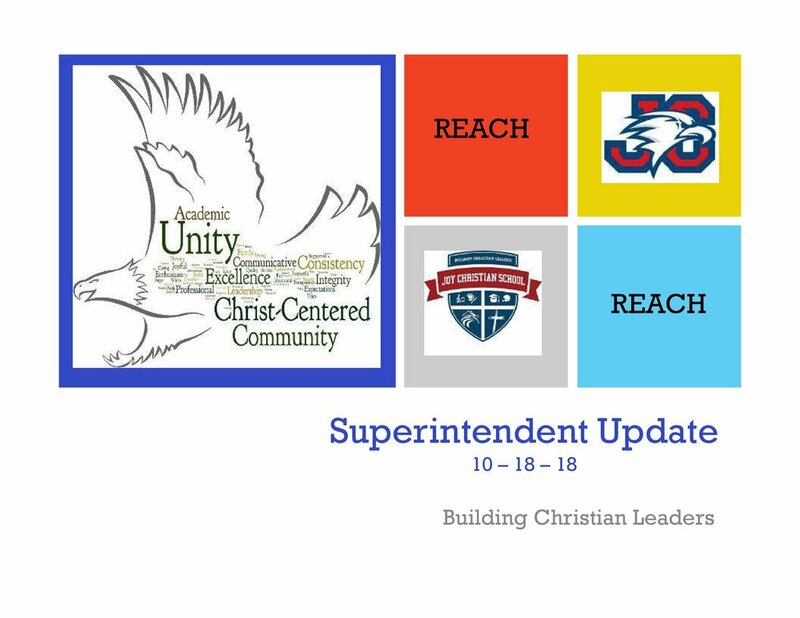 Therefore, we have added a STEM/Curriculum Director (Alicia Roberts), Dean of Students (Patrick Blakesley), and a Student Advocate/Counselor (Erica Rice). Additionally, for added alignment and focus, Diane Stair will now oversee PreK – 5th Grade, and Ron Terrall will oversee 6th – 12th Grade. Thank you to all of our parents who have helped inform us of the types of information you would like to have available on our website. We’ve made some significant changes based on your feedback and think you will appreciate the added links, layout, and information. Make sure to click on the info link “Points of Light.” This will be a running blog of all the great things happening on our campus. There is so much more good news to share with you, so please be on the lookout for additional communications from each of our departments over the next few weeks. Over the last month and a half, many of the Joy Staff have submitted for and been awarded Thrivent Service Project Grants. The staff have used these grants to help beautify our campus. Additionally, we’ve had parents and local businesses donate to our school so even more projects could be completed. We love our school, parents, and community. Just wanted to give a great big Thank You to all who contributed to these beautification projects. Come Visit Our New STEM Lab and Explore All the New Techology Across JCS's Campus! The count down has begun for an exceptional new year at Joy Christian School. As the new Director of Curriculum and STEM I would like to share the philosophy, purpose and activities our K-12 students can look forward to in the new K-12 Curriculum Map and STEM Program for 2018-2019. Please be sure to take a look at our website and see the new format and information for the upcoming year. The K-12 curriculum is built upon a foundation of a biblical world view. Academic materials and classroom activities are designed to encourage students to consider the Creator and glorify Him through their studies, peer/teacher relationships and collaboration within the greater community. New technology and hands-on activities embedded into the curriculum will be used to prepare students for careers that are global, impactful and Christ-centered. We believe that God's word is the only truth that can positively impact the world in a sustainable manner. We have committed to a year long professional development program that emphasizes why we must provide our students a biblical worldview across the curriculum and throughout each subject. Our new state-of-the-art STEM Lab was created to allow our students to experience the joy and discovery that comes from understanding how a biblical worldview provides for a life of harmony with God's law and design. We have been extremely blessed to have been selected to pilot the newest technologies, receive grants for future growth and be acknowledged from experts in the STEM field for our commitment to a greater calling than our own glory. I look forward to this new journey and ask that you take the time to pray for all of our students, families, faculty and staff that we may shine as a light upon the hill in this new year! Please feel free to reach out with questions or inspiration. - PLEASE WATCH THIS VIDEO: “More Than a Sport" video produced by Trek: https://youtu.be/wimNfA_LLjg. - This is a great sport for those who want to experience what sports can offer. No need for exceptional athletic ability - just a bike (and a helmet). - Please let me know if your son or daughter would like to participate by July 4th. Practices will start Mid-July. Joy's high school Principal Ron Terrall would like to announce for the 2018-2019 a new partnership with West-MEC inclusive of career and technical education programs for our students. These programs include but are not limited to Pharmacy Technician, Medical Technician, Automotive Technology and Vetinarian Science. Mr. Terrall has planned a field trip to the Wes-MEC campus for interested high school students in September. Mr. Terrall is commitmented to seeking high value academic opportunites for our high school students and finds West-MEC to be an exemplarary program to advance college and career readiness. Joy Christian continues to rise above the rest of private schools in the Valley and is pleased to be the only private school in the Valley in partnership with West-MEC.